What is a Haku Lei? Hawaii is home to the most beautiful flowers in the world! 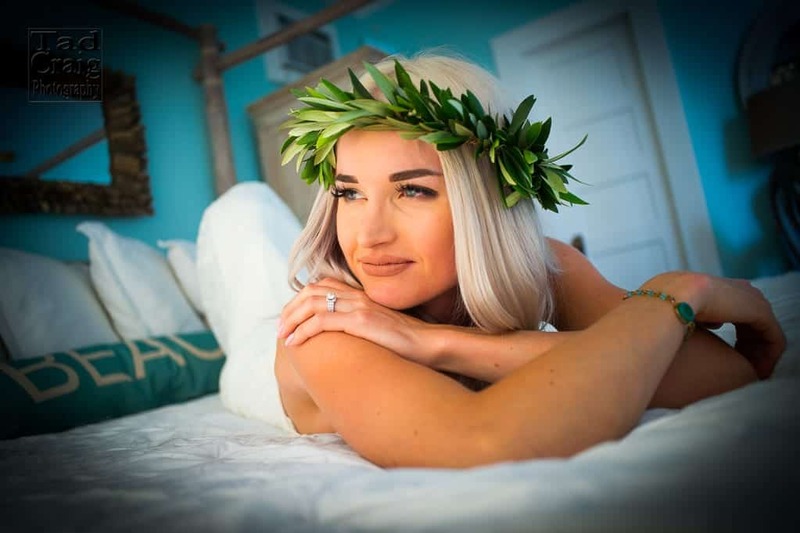 The Hawaiian Haku is a crown of flowers that is placed on your head as a headdress and is popular for weddings. The bride looks like royalty with this ornamenting flower headdress that compliments the dress and venue in which she is uniting with her partner! Traditionally, a white haku is worn but many brides have colorful haku’s made and look especially colorful on their special day, even color coordinated with their partner and color ensemble. A bride will glow on her special day with these radiant flowers that will decorate her hair for her special occasion. You will adore your choice to wear a Haku lei! 1. Flowers are a woman’s best friend. Tropical flowers are beautiful and adorned around your head makes you feel like a tropical princess. The flowers are ecstatic that they get to lay there and whisper sweet nothings in your ear before you walk down the aisle to your prince in waiting. Your sweet prince will look at your lovingly and kiss you and he will ponder how his dreams came true and how the woman of his dreams is decorated in the most beautiful flowers in the world and how you both will spend the rest of eternity together forever. He will never forget your flower crown and the memories that he will have of this unforgettable day. Flowers are truly a woman’s best friend. His day can’t get any better. Neither can yours, you’re wearing a flower crown. You are the queen! The Flower Queen! If you have ever visited the Hawaiian Kingdom, you will know that the breeze is the ruler of the islands. Makani is the term for wind and your hair will love to blow around in these gentle Hawaiian winds. In case you may not indulge in the windblown look, flower crowns are for you! By wearing a flower crown you have eliminated flyaway strands of hair just like that. They are not only beautiful but delicately placed to keep your hair down! This is the best-kept secret on the islands of Hawai’i. Your hair will look spectacular! 3. Your Bridesmaids will want to wear them too! Do you and the girls get dressed up for a night on the town? Matching lipstick, same color mini skirt? What about matching flower crowns? This is the wonderful thing about having to decide what the bridesmaids will wear, why not include a Haku lei? Many brides and bridesmaids have joined the fun by getting ready with champagne and flower crowns! 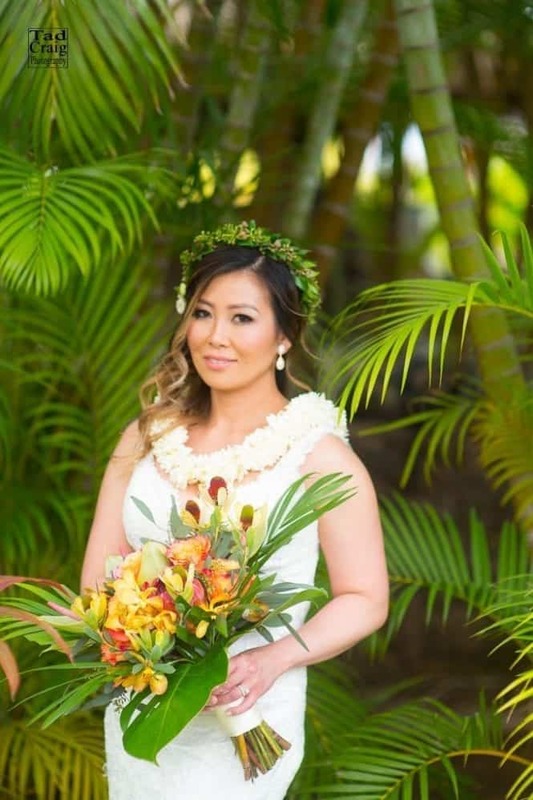 This is one of the most enchanting ways to spruce up your Hawaiian wedding! You already had your Bachelorette party with these lovely ladies, (who know how to through a party) why not dress them up in the flowers that they deserve on your extraordinary day? Your bridesmaids will thank you and will always remember this special day! 4. Hawaii is unique that the flower crowns never go out of style! Hawaii is known for the tropical flowers that call the islands home. Some trends go in and out of style but here in the islands, flower crowns will be forever popular, stylish and represent royalty! Visitors from all over the world come to visit the islands and notice a style of freedom, ocean, greenery, and FLOWERS! You will want to adorn yourself flowers especially for your wedding day! There are many places to create your own Haku’s, our favorite place is Haku Maui in Makawao, Maui. YOU can create your own haku with friends and family and sip on champagne with pupu’s (appetizers in Hawaiian) and snacks on your lovely vacation or wedding. 5. You can customize your own special look into your flower wedding crown! Many ancient Hawaiians would make their crowns out of bird feathers. Their haku’s were genuinely fabulous and gorgeous. On your special day you may want to add a special touch to your flower crown, you could be like the ancient Hawaiians and add a special feather or something unique to you and your beloved! Maybe a mini veil would look nice or a special trinket that you have saved for just this special occasion! 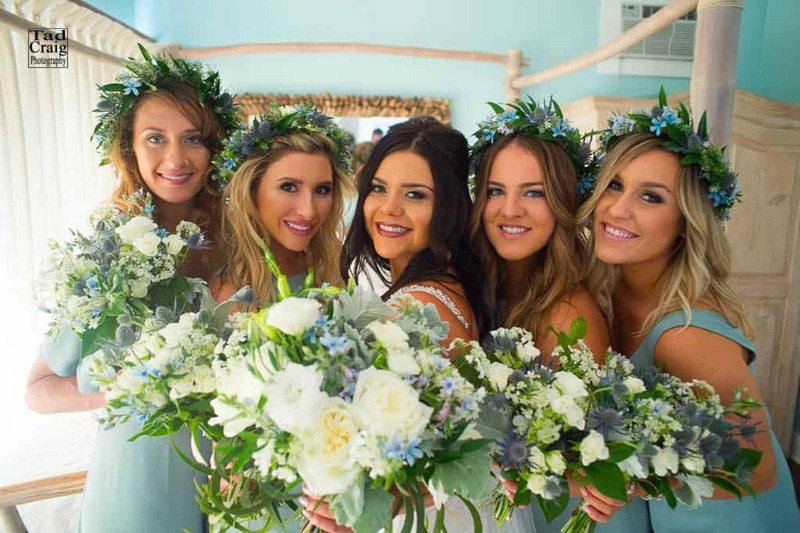 You may want to consider something blue to perfect all of your wedding goals!! You can get as creative as you like! 6. The type of flower you choose has meaning! Ancient Hawaiians have meaning for everything. The beautiful plumeria flower symbolizes positivity! Sometimes arranging a wedding and your wedding day may become a little hectic. It has been said that wearing flowers, especially plumeria flowers does sooth the soul and exude positivity. It is as if the little flower is giving you it’s blessing when you wear it around your neck and or as a crown. It induces love, positivity, and elegance. Once you have celebrated your special day and have said, “I DO,” to the love of your life you can wear the plumeria flower behind your left ear to represent that you are married and your bridesmaids and or friends that are in search of the love of their life and are still single will wear the flower behind the right ear to show that they are available. 7. Wearing a flower crown represents ALOHA! When you get married in Hawaii, it is different than any other place in the world! It has its own feeling and you can’t get anywhere else in the world. This is why so many people get married in Hawaii. Almost 20,000 weddings were held in 2017 across this gorgeous state and every year the numbers are growing. By wearing a flower crown and getting married in Hawaii you are defining the word Aloha, it means many things, LOVE, CELEBRATION, HONOR, AFFECTION, PEACE & COMPASSION. These are all wonderful terms and emotions that we share with our significant other and friends and family. This is the best way to start out on your journey with the love of your life and always remember to live and practice ALOHA no matter where you are! I was very thrilled to be a part of this amazing wedding! My very good friend, Mark Friezner, who I ride bicycles with, had wanted me to cover his daughters’ wedding and he informed me that it was going to be very special, but I just didn’t realize how significant it was going to be! I had arrived early to the wedding location high on the hill, overlooking the Pacific Ocean and Lahaina! The views in every direction were gorgeous. Flowers adorned all the tables and chairs and you could feel the excitement and anticipation in the air! I had first visited Mark’s room as he was getting ready with his groomsman and the noble little ring bearer. Mark was very casual, passing the time, having a few laughs with his friends. I then ventured off to the brides’ room, where getting ready was a frantic affair. There were so many girls getting their hair and makeup done and finding their jewelry, putting on dresses and adding the last minute touches, we had to work fast to capture the passing moments, but all ended well. Amber, the bride, was so excited and looked stunning and I especially liked the few quiet moments she spent with her mom and dad. It was all very touching! The wedding itself was gorgeous with all the guests looking on with love in their hearts as Amber & Mark joined their souls together as one. The location added to the meaningful and poignant words the minister said to them. Once the ceremony had finished, they flung their hands up in the air in celebration and they walked down the isle with their families and friends screaming in excitement for them. It was magnificent! Later that day, we ventured down to the ocean for beach pictures and it was the first moment they were able to actually be alone with each other as husband and wife. Amber and Mark are so kind and loving and they share a deep connection which I could sense as they walked and held each other. We continued on our photo adventure up the hill, but had to stop on the road as we looked at the INCREDIBLE backdrop of the West Maui Mountains surrounded by a the exquisite blue sky! It was so radiant as they held hands and playfully led each other up the center of the road celebrating their special day hand in hand. When we returned to the estate, Amber & Mark were ready for their first dance! The sun was peaking through the trees which made for spectacular lighting with bokeh’s (which are the unfocused lights which you can see in the dance pictures). The shot I especially liked was the one of Amber & Mark holding each other tightly looking into each other’s eyes and out of focus in the background are their parents looking on. It couldn’t have been more perfect! I didn’t really know what to expect at sunset as we were so high on the hill, but as usual, the sunset was stunning! Everyone was very thrilled with the way the day had turned out! My favorite picture of the evening was before the toast, I noticed the wonderful backdrop and the “LOVE” signs and knew we had to combine these elements into one picture. The last image of this post is the image of Amber & Mark kissing. It was such a fantastic night of celebration and connection of two beautiful souls & two loving families! Thanks for including Tad Craig Photography in creating your Maui Memories! Thanks to Sarah Cravalho planning this well organized shindig! The gorgeous flowers created by Teresa Sena Designs! Dale Votta Catering & Karen Friezner for all the awesomeness!!! I was very thrilled to be a part of this amazing wedding! Lauren & Ethan, Finally get their Dream Maui Wedding, and it was Glorious! It was a perfect bluebird day and their wedding location was high on the hill overlooking the beautiful blue pacific ocean! I eyed the colorful bougainvillea bush, knowing that we would make our way back to this gorgeous setting to capture a few amazing moments! I made my way to the Grande reception hall and I was greeted with an impressive table set to perfection with flowers generously decorated with a copious amount of details making for gorgeous pictures! The entire room smelled as delicious as it looked! After I had captured all the images I needed, I continued the trek to meet the bride! Lauren was in the initial stages of getting ready so I had time to capture lovely moments of her getting ready! Once she was ready, we moved to the small creek flowing through the property where we captured beautiful bridal portraits and finally it was wedding time! They had already married 4 years earlier so this is technically a vow renewal, but when then did first marry, it was in a court house, with no family and no friends in attendance! So really this was the wedding they had both dreamed of!! Lauren walked into the wedding site with Ethan waiting to meet his lovely bride and finally say their vows they had always wanted to say with their families and friends watching! Joe Miles was their officiant and blessed them with his incredible words. What he said really touched me deeply and I was only listening from afar! Great Job JOE! Soon it ended with everyone congratulating them and wishing them the best! It was beautiful! Once we had finished with all of the family photos there was a nice moment where the two of them were sitting at the site talking and whispering into each other’s ears. The shots of the two of them sitting there were so pretty! We then journeyed to White Rock Beach where the soft light made for beautiful images at sunset. The sun was bright orange and was about to be swallowed by the ocean as the two of them embraced each other on their special day on Maui. We then headed back to the reception where it was a nicely arranged with the array of flowers, food, and the reception table. The music began to play and Lauren & Ethan had their first dance, I was able to capture that moment and I then left the two newlyweds to dance, laugh and celebrate the night away. I always ask my client’s how they met and I wanted to share their story with you in Lauren’s special words. Please enjoy. I was introduced to Ethan by my step-mother, who was living in Colorado, also Ethan’s hometown, while I was going to nursing school in Texas, living with my mother. She had known Ethan for many years, and she waited many years until she knew we were both single at the same time to make her move. The first time Ethan called me, he was literally at the airport getting ready to ship off to boot camp. Our first conversation was weird because we both felt like we had known each other for years. He asked me to write him while he was in boot camp, and so I did. I think we started to fall in love through our letters. We both realized that we had sooo much in common, including both having a goal to live on one of the Hawaiian islands once our careers were started. He used to live in Maui for 5 years, working as a cordon Bleu chef at I’O and he has always wanted to return for good. This is where his heart and soul lives. Anywho…he had his mother send me a plane ticket to come meet him in person for the first time at his boot camp graduation. I went…we met…and spent about 1 day together before he had to report to his command. I flew home and told my best friend, this man will be my husband. We kept in contact through Skype as he completed his submariner schools. He asked me to marry him 4 months into our relationship. We agreed that we would get married but for 1 yr live apart because I had just signed a year contract at a major hospital in Texas, and we knew that the only submarine bases in the states were in San Diego or Washington, or Hawaii. Everyone told him, there was no way he’d get orders to go to hawaii because it is very rare, so we never considered it. About a week before he was to graduate and come to Texas to marry me, he received his orders for….Oahu! At first, we were sooo happy because I knew he wanted to be in Hawaii but then we realized that it would be way to difficult and expensive commute to see each other. He graduated, hopped on a plane, and married me the very next day, on the second time we had ever even seen each other in person, or spend more than one day together, but when it’s right, it’s right. We had a small court house ceremony with my son and step-mother as witness. Two weeks later, I decided to leave my job, pull my son out of school and move to Hawaii to be with him. After 3 years, I had a great job and was ready to throw us a special wedding with our closest friend and family, on the land that he feels is heaven on earth, Maui! Now, married for almost 4 years, we are still as happy as we can be, more deeply in love than ever, and devoted to one another for life. Our wedding in Maui was so special, small, and perfect for us…one of the best days of our lives. Congratulations to Chantel & Kris on their super wedding at the absolutely gorgeous Olowalu Plantation House in Olowalu Maui. Their wedding day was pretty much perfect, with no wind, no clouds & gorgeousness every where! The views at this Maui wedding venue are incredible, with South Maui, The islands of Molokini, Kahoolawe, & Lanai all right there in one quick glance. Of course all of the guests were delighted by the ambiance & most importantly the elation of the guests of honor celebrating in such a great spot. Keli”i Brown’s ceremony was spot on & the emotion showed in Chantel’s face as she shed tears looking in to her lovers eyes as he said his vows to her. Very sweet moment during the ceremony. Chantel’s brother has the cutest little kid & of course cuteness always steals the show. Look closely for the little guy sitting on the grass clapping his hands with the bride & groom in the background. Love that picture. So cute! Afterwards we explored the palm trees for some images & then out on to the pier. Love that shot of them walking out there with the HUGE Maui sky taken by my second shooter Marie Claude! Great Shot! Once out on the pier we were stoked to see the waves crashing against it making for some dramatic shots & of course the reflection shot of them kissing was a good one. Back at the reception they danced & partied with their friends & family & were treated to an amazing sunset, that left this gorgeous pink & purple hues in the sky making for incredible color. Such a happy couple! Thank you so much for making me apart of your Maui memories!